It was a very busy week for the skies of Pakistan since April 9, the country has been witnessing some daily formation of thunderstorms that is keeping the weather pleasant and cool though it may feel good but in real it is having a drastic effect. Since April 9 till April 24, two western disturbance has affected the country with varying intensity. Sudden high temperatures that were seen before April 9, have now dropped to below normal in almost all parts of the country. Frequent showers also have badly affected the harvesting season. If you love monsoon season, you better pray for this sort of winter activity to end! 38 days to go – For what? Fresh Activity in the North! Western Disturbance 01, the first Western Disturbance of summer season, which PWP named as ”01″ reached the country on April 9 and remained so till April 14. Rainfall occurred in Islamabad on April 8, heavy rainfall in Murree on April 14. While unusual light hailstorm occurred in the southern city of Hyderabad on April 12. Drizzle occurred in Lahore on April 13. Western Disturbance 02 was a large storm with cyclonic circulations at the centre of the storm. The wave had gust fronts as well. WD 02 entered west-central Balochistan including Quetta on April 17. It caused a coastal thunderstorm to form near southern Pakistan that killed 6 people in Oman, it caused rainfall (5 mm) on April 19 in Karachi with strong winds (60 km/h) and Makran coast. 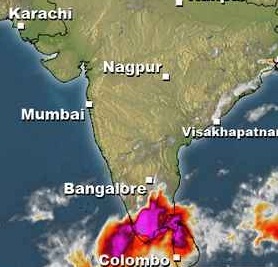 WD 02 caused countrywide rainfall with varying intensity. It caused a Microburst on April 20 near Islamabad that caused Bhoja airline to crash, same day sharp showers (8 mm) occurred in Islamabad with fast winds (68 km/h). On April 20, it caused isolated shower in the upper parts of Sindh. It caused showers with gale-force winds in Gujranwala on April 22 night. On April 23, it was over northern Pakistan and adjoining however it caused some more showers in upper Sindh on April 23 evening. On April 24, it moved into India and started its affect over adjoining Nepal as well. Size wise, Length wise, effect wise and duration wise, Western disturbance 02 has been the most strongest western wave since 2011-2012 winter season. Western disturbance 03 is likely to be much weaker than its precedor but WD 03 along due to heat moisture is likely to cause some showers with thunder and strong winds in the northern areas; and few adjoining areas. This fresh western wave would enter northern Pakistan on April 25, due to moisture incursion some stray thunderclouds could form over central Punjab and Balochistan that could bring rainfall to those areas as well. This wave is likely to stay till weekend after that the skies would start to clear up as the wave would move into India. Intensity wise, WD 03 is not strong but some well-developed thunderstorm could form over northern Pakistan and adjoining Jammu & Kashmir. Where rainfall is likely from this wave? Northern Punjab, Khyber, north-western Balochistan, Gilgit, FATA and Azad Kashmir are the areas where the affect of western disturbance 03 is likely to be felt. But due to stray thundercloud formation, central Punjab and Balochistan could also get some isolated showers during this period. Islamabad, Lahore, Multan, Quetta, Faisalabad, Murree, Muzaffarabad, Peshawar and other adjoining cities are expected to get precipitation with varying intensity. Rainfall would be accompained by thunder/fast winds in many areas. Western Disturbance 03 angry with Karachi! Majority of Sindh is likely to remain dry especially coastal and few adjoining south-eastern parts. 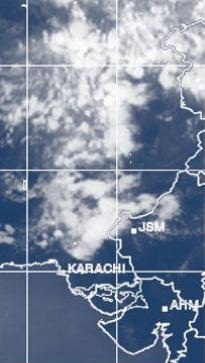 But upper and adjoining areas of Sindh might be lucky as due to heated land surface areas and moisture winds coming from the north-western direction may give rise to some thundercloud formation till April 26 night therefore there are chances of isolated showers with fast winds in Sukkur, Larkana, Nawabshah, Hyderabad, Dadu, Jamshoro and few other cities. Karachi on the other day would remain dry with passing by clouds on April 25 and April 26, winds could reach 25 mph. Does not look to be lucky this time Karachiites! Activity in the Bay of Bengal! 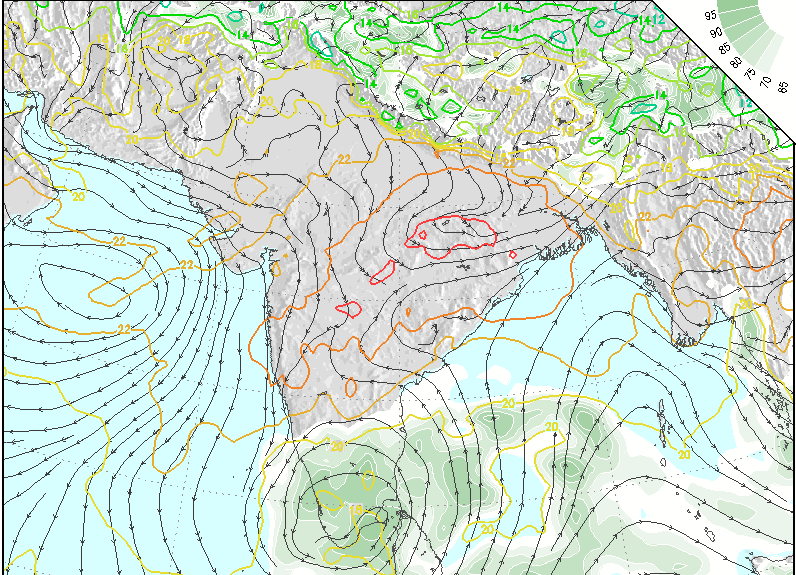 The Low pressure is currently near the eastern coast of India, is likely to fizzle out but not soon. The low pressure was few days back forecasted to strengthen into a depression at 1000 mbar and move along the eastern coast of India though it did not happen. The Low is taking a new path and it is all set to enter into the Arabian sea but do not get to happy now. There is an anti-cyclone in the Arabian sea along with high vertical wind shear that is likely to hamper further intensification, these conditions are likely to stay till at least one week. The low pressure would move along the western coast of India and it would finally lose intensity on April 29 and head back in a North-eastern direction from the southern tip of India. Due to the frequent invasion of western disturbance, the seasonal heating has so fair remained poor to almost none. Heating phenomenon has started in the eastern parts of India but has failed to reach beyond. But there is a little hope of western Sub-continent. From April 26, temperatures are expected to shoot off in Sindh province of Pakistan including Karachi, Hyderabad, Nawabshah, Sukkur and other cities. Temperature could reach the highest of 41°C – 42°C during late this week. But could this heat be affected by western disturbance 04? When will the heat system enter in karachi and for how long??? babar bhai tell me Larkana Weather and rain chances till 1st May. Below normal monsoon for Karachi, Like Always !